Meat is not for everyone. If you didn't grow up in a meat-eating household, or if you're a former vegetarian, cooking it can seem a little daunting. It is, however, not that hard to cook, but there are some common concerns people have when they first embark down the path of cooking animals. Spreading germs all over your kitchen and life is a big concern when preparing and handling raw meat, especially if you're dealing with chicken and pork. Step one of handling this concern is accepting that you are going to be exposed to germs, feeling your feelings about it, and then taking comfort in the fact that soap and water exists. If you are concerned about cross-contamination, a raw-meat-only dedicated cutting board can help, just make sure to get a wooden one (which is naturally anti-microbial), rather than a plastic one (which are impossible to disinfect unless you have a dishwasher). A mise en place is also indispensable when it comes to keeping your work area clean. Having all of your seasonings measured, vegetables chopped, and other ingredients all set and ready to go means you won't have to keep turning the sink on with your elbow so you can wash your hands before grabbing the salt. It will also keep you calmer overall, which means you're less likely to absent-mindedly grab something with your raw-meat-contaminated hand. Speaking of hands: wash them. Wash them before you touch raw meat, after you touch raw meat, and after you handle any utensils and cutting boards that have touched raw meat. Also, resist the urge to rinse your meat, as all this is going to do is spread germs and bacteria around your sink and counters by way of a grody splash zone. Instead, save your cleaning for after the fact. Hot, soapy water is usually all I use on my cutting boards and utensils, and a run through the dishwasher will definitely take care of any lingering grossness. But if you don't have a dishwasher, or just need to be extra sure that everything is completely clean, you can use an extra dilute bleach solution on your boards, cutlery, and surfaces. You just need a tiny bit; one teaspoon of liquid bleach in a litre of water is plenty. Just spray it on, leave it for ten minutes, then rinse with running water or wipe up with a wet cloth. Pork: Uncured cuts of pork, such as chops and roasts taste best medium-rare (65 degrees), which means they will be a little pink. Despite what you may have heard, this is perfectly safe; as trichinae are killed at 58 degrees . If you like your meat medium you can go as high as high as 70 degrees, but you run the risk of drying out that beautiful pork, which is sad. 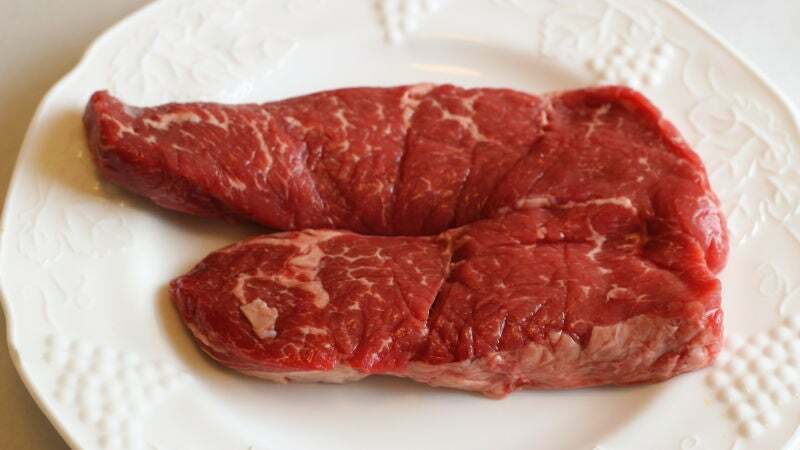 Beef: In terms of safety, good beef bought from a butcher you trust can be eaten raw without too much concern. (This does not apply to tubes of hamburger you find at the grocery store.) In terms of taste, it depends on what cut you're dealing with. 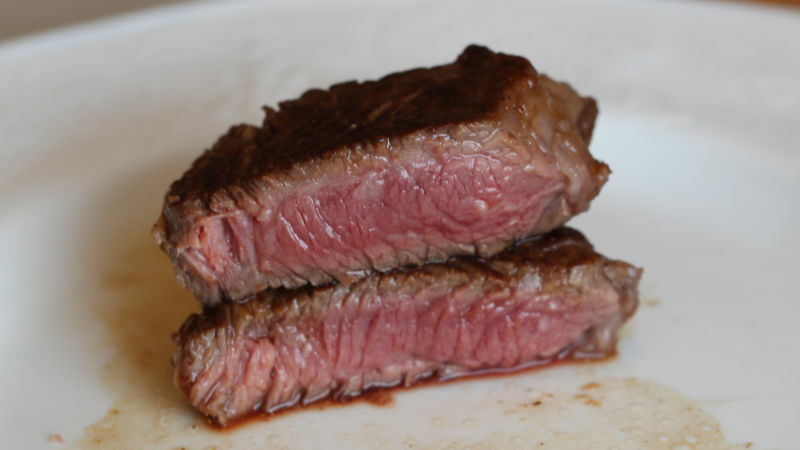 Steaks can be cooked to rare (50 degrees), medium-rare (55 degrees), or medium (60 degrees), or medium-well (65 degrees). You're probably like "What about well-done?," and to that I say "Who hurt you and told you deserved dried up meat?" Roasts require slightly higher cooking times: 55 degrees for rare, 60 degrees for medium-rare, 65 degrees for medium, and 68 degrees for medium-well. I'm not going to lie to you, it is possible that you will, at some point, ruin a perfectly good piece of meat. The good news is it's not the end of the world, you can order a pizza, and failure is actually a very good teacher. This does not, however, mean you shouldn't try to avoid wasting food. Besides buying an instant-read thermometer and following the temperature guide above, there are a few strategies you can employ to make your meat-cooking life easier. First, start small, and buy easy-to-cook cuts. Though roasting a whole chicken isn't extremely hard to do, it can be difficult to perfect, and it isn't the best place to begin if you're extremely new to cooking meat. Breast and thighs need to be cooked to different temperatures for maximum enjoyment and, while this is achievable through a whole-bird cooking, approaching each one on its own is a lot less overwhelming. 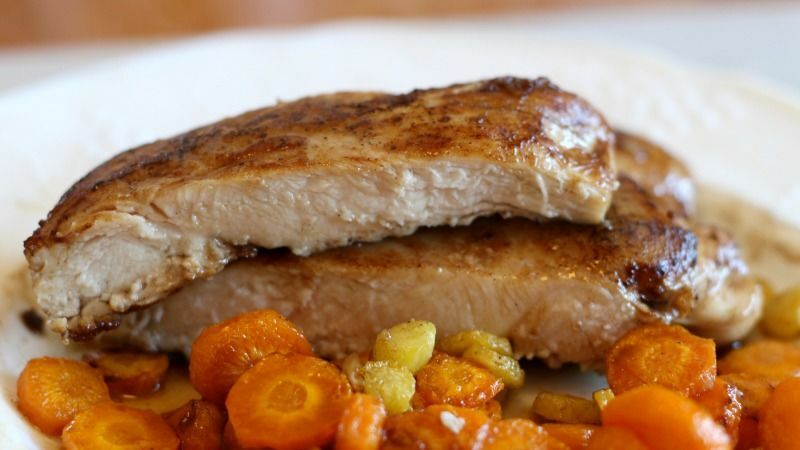 If you're a fan of white meat, grab a couple of chicken breasts, then pound them out to an even thickness before cooking. This will not only ensure the meat cooks evenly but, because it's now thinner, it will cook faster, meaning it will have less time to dry out. If you're a dark meat-eater, rejoice, for chicken thighs are quite easy to render delicious. You can buy them with or without bones and skin, but bones and skin are what make them so great. This super easy recipe from Martha Stewart is a good place to start, but if you really want to maximise crispy skin — and who wouldn't? — try rubbing the thighs with a mixture of salt, pepper, and baking powder, as suggested by the Food Lab. (One teaspoon of baking powder for every tablespoon of salt will get you there; add pepper to taste.) Let the meat rest in the fridge uncovered for 12-24 hours, then roast at 190 degrees Celsius until the thighs reach an internal temperature of 70-75 degrees. Once you've mastered individual parts of the bird, you can tackle bigger projects. In terms of steak, the big concern is always overcooking and ruining something beautiful (and expensive). The best way to avoid this tragic fate? Don't buy expensive cuts until you're comfortable cooking steak! I am not, however, suggesting you buy crap meat. Here's a guide to getting the most out of cheaper cuts of steak - if treated well, can end up tasting as delicious and tender as a rib eye. Start by marinading your steak overnight (or up to 24 hours) in the fridge in a marinade of your choice. After everyone has gotten to know each other, wipe the marinade — do not rinse — off the meat and pat it dry with paper towels. Sear in a heavy pan over high heat, using either a neutral oil or butter if you like a lot of crust — for a few minutes each side until the internal temperature reaches 50 degrees. Let rest for five minutes, then devour. Finally, if you really plan on eating a good bit of meat, and want to do so with minimum stress, it's worth investing in some sort of sous-vide set up, which will give you exact temperature control, virtually eliminating the threat of overcooking. I have cooked a lot of things with my immersion circulator, and pretty much every piece of meat — from chicken feet to alligator — have come out perfectly every time. I actually refuse to cook pork chops any other way. This is going to sound kind of harsh, but if the main thing keeping you from cooking meat is that you don't like being reminded that your food was once a living thing, meat eating might not be for you. When you eat meat, you eat an animal, and being aware of that is important. If you can only eat a chicken after it's been formed into a benign-looking nugget, you may want to reconsider your diet. Like the muscle, bones and connective tissue are just another part of the animal, and they can add a ton of flavour and juiciness to your cooking, and using as much of the animal as possible is the most respectful, economical, and eco-friendly way to consume it. So don't fear bones, embrace them. Hopefully this has assuaged some of your meat-based fear, and you're ready to get cooking. One final tip: never be afraid to ask (me, if you like) questions, and read as much as you can. There's a lot of good meat knowledge out there, both on the internet and in cookbooks, and there's no reason for you to stumble blindly around when other people have already put in the work. Umm are you sure 175 degrees Celcius for legs and thighs, that sounds considerably high, did you forget to convert that number ?